This book arises out of the work of the Emerging Researcher Programme at UCT and follows on an earlier publication. 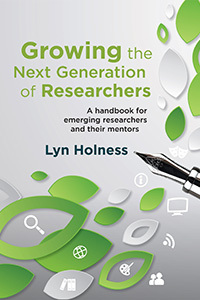 Designed as a tool for emerging researchers and their mentors, it provides strategies for research growth in areas such as understanding the relationship between teaching and research; obtaining higher degrees; producing peer-reviewed research output; generating and managing research funding; effective research planning; engaging in interdisciplinary research; and postgraduate supervision. While the year is drawing towards a close, the journey of many a PhD student is just starting to gain momentum as they get accustomed to the way of research. Thursday 3 September saw the commencement of the annual PhD Breakaway, a collaborative program of workshops, seminars and panel discussions aimed at breaching the loneliness of the PhD journey through fostering a sense of community. Amina Adam (Research Commons Librarian) and Theresa Schoeman (Marketing Librarian) from UCT libraries were also in attendance advocating the many services that UCT libraries has to offer to postgraduate students.